It's that time of the year again for Collected Editions to offer my top trade paperbacks and graphic novel presents for you to give as gifts this holiday season. I think I've got a couple of winners here that'll make you a hit with your loved ones (or that you might want to snag for yourself!). Of course, there's nothing I like less than using my holiday money on shipping, so once again I've got tips for how you can get three, even four or five books all with free shipping. Don't miss my 2012, 2011, 2010, 2009, 2008, and 2007 lists for more great ideas. Happy gifting! The JSA Omnibus doesn't come out in time for the holidays, but I thought I'd mention that it's selling right now for almost 40% off. If you've had your eye on it (especially since the contents changed) or need to have a gift for your favorite comics fan in reserve, this is a good opportunity. Geoff Johns's tale of DC's Golden Age heroes training the new generation is some of my favorite of Johns's work. Pair with anything else on this list -- the JSA Omnibus comes with free shipping, so you can order to your heart's content as long as you have this in your cart. Every year I like to include a couple items on the gift list, not too expensive, that you can use to pad out your order for free shipping, and then you can either give them to a young reader in your life or donate them to charity. This children's Spider-Man book is under $5.00 and written by Frank Berrios (former DC Comics editor), and it'd be a fun introduction to comics for a young reader. Pair with Captain America: The Winter Soldier and Monolith, Black Beetle, or Star Wars: Shadow of Yavin for free shipping. This might very well be my favorite Superman story (though Superman: Panic in the Sky is no slouch), and certainly with the Superman/Batman movie coming up, now's the time for every comics fan to get this in their collection. This three-part story heralded the beginning of the great Triangle Title days in 1990s Superman comics that also brought us "Death of Superman." A murder brings Batman to Metropolis just as Clark Kent himself is marked for death; it's a great mystery and also makes a landmark change in Superman and Batman's partnership by the end. If you or your favorite comics fan has not read this story, do yourself a favor and pick it up, a steal at under $10. Pair with the Amazing Spider-Man Golden Book, Star Wars: Jedi Academy, Sonic/Mega Man, and Lazarus, and get five gifts for $35 with free shipping. Or, add something like the Al Jaffee biography or the Fables Encyclopedia and also get free shipping. I reviewed Grant Morrison's Image comic Happy! back in April, but it's really a Christmas story (of sorts), and Image has a deluxe edition just in time for the holidays, with ten pages of new material. Be warned, however -- I called Happy! a "demented" Christmas story in my review and I meant it. This is Christmas by way of a Quentin Tarantino movie, in which a hardened hitman hunts down a kidnapper in bloody fashion -- while accompanied by a bright blue cartoon horse. 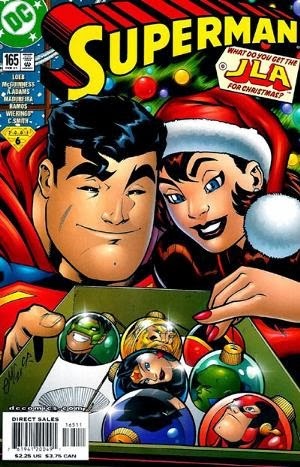 If your favorite comics fan takes their holidays a little less seriously, Happy! should make them, well, happy. Pair with Lazarus (an equally bloody story) and then a book like March, Black Beetle, or Monolith for free shipping. Pair with anything on this list; each book comes with free shipping, so you can use these to secure free shipping for your entire order. The first trailers for Captain America 2: The Winter Solider are hitting the airwaves, and if you don't know it, your favorite comics fan does: the movie is based on a very popular storyline by fan-favorite writer Ed Brubaker. A few years ago Marvel released this Winter Soldier Ultimate Collection, which includes Brubaker's Captain America #1-14. This sizable volume will make a good impression on your favorite comics fan and help them gear up for the flick. Pair with Happy! and the Amazing Spider-Man Little Golden Book for free shipping on your order. Many of us fell in love with Francesco Francavilla's pulp artwork in his contributions to Batman: The Black Mirror, and I love seeing his designs on Twitter. Black Beetle started out as a webcomic of sorts on Francavilla's website; Dark Horse eventually picked up the series and now Francavilla is writing and drawing Black Beetle as an ongoing set of miniseries. This first collection has been in my "to read" pile for a week or so now; it collects Dark Horse's Black Beetle #0 and the first four-part story arc, "No Way Out." For the superhero or pulp fan that's mostly stuck with the mainstream, Black Beetle might be something for them to check out. Pair Black Beetle with Monolith and Lazarus from Image and get your favorite comics fan some great "indie" comics with free shipping. This biography of MAD's Al Jaffee came out a couple years ago, but I just stumbled upon it in a bookstore the other day. Anyone who's ever read MAD (or used to read MAD as a kid) knows Jaffee's work, from the MAD "fold-ins" to "Snappy Answers to Stupid Questions" and plenty of bits in between. Though not a graphic novel, Jaffee illustrates this authorized biography by Mary-Lou Weisman, and it'd make a great companion gift for a long-time comics fan. Pair with Superman: Dark Knight Over Metropolis for free shipping, or add Star Wars: Jedi Academy and Sonic/Mega Man to get free shipping and gifts for young and old on your list. Bill Willingham has announced that he's bringing Fables to a close with issue #150, so if you're a Fables fan (and who isn't?) or know one, you might start feeling a bit nostalgic. DC Comics/Vertigo has just released the Fables Encyclopedia by writer and comics annotator Jess Nevins, who details the backgrounds of all the mythic and fairytale figures Willingham has used in his Fables saga. If you're in the mind to revisit Fables, this is the way to do it right. Pair this with Lazarus and the Amazing Spider-Man Golden Book for free shipping; this reference book might also pair well with the Al Jaffee biography, with free shipping. March is by congressman and civil rights figure John Lewis, and it begins to chronicle Lewis's life journey. The book is nonfiction, black and white, and part of a trilogy, so this is a great gift to get a comics fan who maybe hasn't read so many graphic novel bios, or even for a young adult reader who maybe likes comics a little better than other books, and then you have two more ready-made gifts available when the other parts come out. Pair with Superman: Dark Knight Over Metropolis for a one-two superhero-nonfiction action, plus maybe something like Star Wars: Shadow of Yavin or Sonic/Mega Man, Jedi Academy, and the Spider-Man Golden Book for free shipping. I thought the first collection of Brian Wood's new "classic era" Star Wars series was very good -- not perfect, but a great, faithful attempt at telling new Star Wars stories. I like movie-based Star Wars comics better than the ones set in the far-flung past or future, so Star Wars: In the Shadow of Yavin was just right for me. If you've got a Star Wars fan gearing up for the new movies, there's no question this should be in their collection. Also out now is Jeffrey Brown's Star Wars: Jedi Academy. Brown is the author of the absolutely precious Star Wars cartoon books Darth Vader and Son and Vader's Little Princess. Jedi Academy is more a storybook/graphic novel than the comic strip humor of the previous books -- think Star Wars meets Diary of a Wimpy Kid, set at an intergalactic middle school. Pair these two together for a Star Wars fan young and old (or a fan who's young at heart), plus something like the X-Files Season 10 collection for a bunch of media tie-ins and free shipping. I like collections, obviously, and especially when there's a collection of unusual or unexpected materials, that piques my interest. IDW is about to release their first Star Trek: The Stardate Collection volume, which collects Star Trek comics from all different publishers, in their general "stardate" order. This first collection includes Star Trek: Crew from IDW, which precedes Captain Pike's tenure on the Enterprise (before Kirk's time), Alien Spotlight: Vulcans, also from IDW (a Pike/Spock adventure), and Early Voyages #1-6, a Pike series published by Marvel. I love this idea of trying to bring the disparate series from various publishers into "continuity," and I'm eager to see this collection series continue. A great gift for your favorite Star Trek fan. For fans of the new movies, I'd also recommend the newest volume of IDW's ongoing "new Trek" comic, Star Trek: After Darkness. Pair with anything on this list. This book qualifies for free shipping on its own, so whatever else you pick up with it will ship free, too. I recently reviewed Greg Rucka and Michael Lark's Lazarus; I'm a fan of Rucka and Lark from their work on Gotham Central, and this new Image series doesn't disappoint. In a post-apocalyptic setting, various "families" negotiate both within and without for power and supplies, buffered by their invincible Lazarus assassins. It's as much an action comic as it is the kind of political procedural that Rucka is known for; this collection includes the first four issues for a very cheap price. Pair with Superman: Dark Knight Over Metropolis, Sonic/Mega Man, Star Wars: Jedi Academy, and the Amazing Spider-Man Golden Book to get five gifts for $35 with free shipping. Or, a creator-owned book like Lazarus would pair well with Black Beetle and Monolith, also for free shipping. Monolith collects issues from Jimmy Palmiotti and Justin Gray's DC Comics series, now re-published by Image. Monolith is one of those books that received critical acclaim but didn't catch on enough to last, and I'm glad to see books like Monolith and Chase getting collections (still holding out for that Peyer/Morales Hourman collection). Though this book is a couple years old, it involves a modern take on the Jewish golem story, making it a perfect Hannukah gift, or simply an introduction to a great overlooked comics series. Pair with Black Beetle and the Sonic/Mega Man crossover for free shipping, or add to the Al Jaffee biography also for free shipping. Regular Collected Editions writer Doug suggested this collection, which collects the first four parts of the Sonic/Mega Man crossover, with two more books scheduled for next year. Kids will like this one, but as Doug said, he's not even a video gamer and he enjoyed it. If your favorite comics fan is old enough to remember Sonic and Mega Man in their original heyday, this one will be a blast from the past, and makes a great stocking stuffer at less than $10. Pair with the Spider-Man Golden Book and Star Wars: Jedi Academy for the young readers in your life, plus something like Happy! or Black Beetle and Lazarus to get five books with free shipping. This has been a good year for media tie-in comics -- Ghostbusters relaunched, there's Smallville Season 11, a Heroes comic is coming, there's Brian Woods's new Star Wars, IDW's Star Trek comic picks up from the movies, and more -- and the one I've been most excited about is X-Files Season 10. Writer Joe Harris gets Chris Carter's blessing for these stories that take place after the second X-Files movie and cameos just about everyone you'd want to see in a new X-Files series. This is in stores in a couple of weeks and I can't wait to get my hands on it. 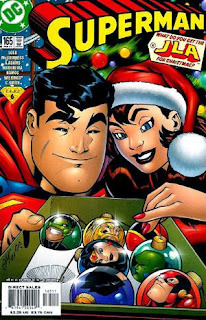 Pair with Lazarus and Superman: Dark Knight Over Metropolis for a great trilogy of gifts, or grab X-Files and Happy! plus the Spider-Man Golden Book -- free shipping either way! If you have more gift suggestions, I'm happy to hear them. Please let us all know in the comments section. (Special thanks to contributor Doug Glassman of Hell Yeah '80s Marvel! for his suggestions.) Collected Editions turned eight this year, and it never could have gone on so long without all the readers who support this site -- thank you, happy holidays, and happy new year! —Mara, from IMAGE, seems a good match for teens interested in "Catching Fire" and "Ender's Game." —The two New 52 hardcovers of Grant Morrison's Batman, Incorporated, which wrap just before the holidays and include the complete story. Sin Titulo! Can't believe I left that one off. Loved this trippy Lost-esque webcomic by Cameron Stewart; I'll be reviewing the Dark Horse collection soon enough. Thanks for the suggestions! I am almost finished reading Ed Brubaker's Criminal Deluxe Editions (finished 1, almost done with 2), and holy wow, this would be on my list! It's just so incredible, and also completely stand alone so it's not too intimidating. Kind of annoyed about that Happy! Deluxe, as I JUST BOUGHT the original trade recently...Is the Deluxe really worth it?? Are the new pages important? Criminal is on my "to read" list; don't miss Zach King's great series of posts on Criminal from earlier this year. I don't know how important the new pages are in Happy!, as I read the original, too; I guess my recommendation is that if one *hasn't* read Happy!, they're probably better off getting the deluxe than the original. - Scott Snyder's Court of Owls volume 1 with Owl mask. A book and a mask, hey! - X-O Manowar Deluxe Edition vol.1. Collects the first 3 trades of Valiants flagship title. The Manhattan Projects, by Jonathan Hickman and industry newcomer Nick Pitarra, has to be hands-down my favorite series of the past year, and the vol. 3 trade just came out! Features by far Hickman's best current writing, and Pitarra's slightly creepy R-rated Rugrats-meets-Where's-Waldo art style is absolutely amazing. I would recommend the new 52 Shazam!